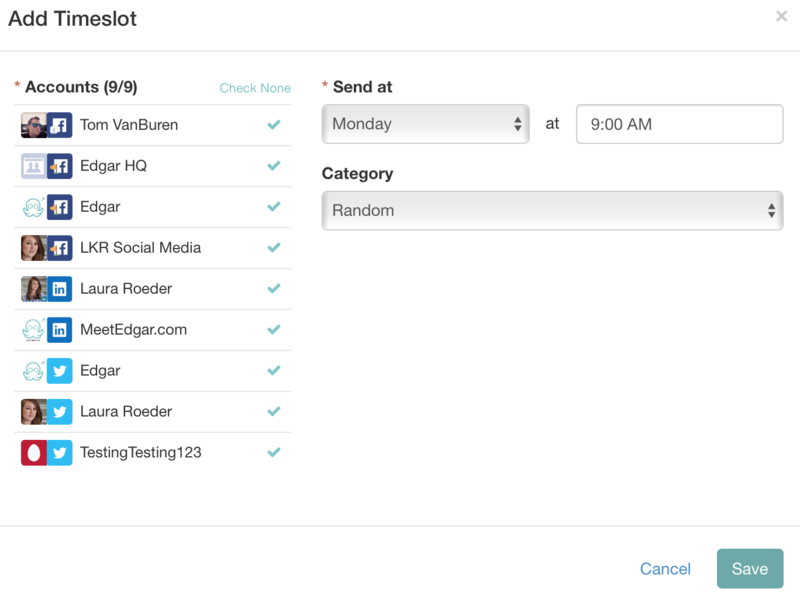 After you connect your social media accounts to Edgar, you can create your weekly recurring schedule. Edgar will publish this schedule each week, automatically pulling content from your library, so you don't have to hand schedule every post! The content you should post and the times when you should post it are unique to you. Check your Facebook Insights and Twitter Analytics to see when your audience is most likely to be online and when your posts get the most engagement. Learn more about the best times to post. Click the Add Timeslot button at the top right or click directly on a day and time in the schedule to add a time slot. Select which social accounts you'd like to send a post to at this time. Select the category you'd like Edgar to pull a post from. Learn more about categories. Make any changes to the day or time, and save the time slot. Once you've create your time slots, you can see what Edgar is planning to post for you in the Queue. Click the All Accounts button at the top of the schedule and select an account to see only that account's schedule. To edit or delete a time slot, click on the time slot to open it. Make any changes you'd like and save it, or click the red delete button at the bottom left to delete it. Random time slots are a great way to mix up your posting rotation and keep things fresh. Random will take all of the content in your library and mix it up into a random order for posting in your Random time slots. 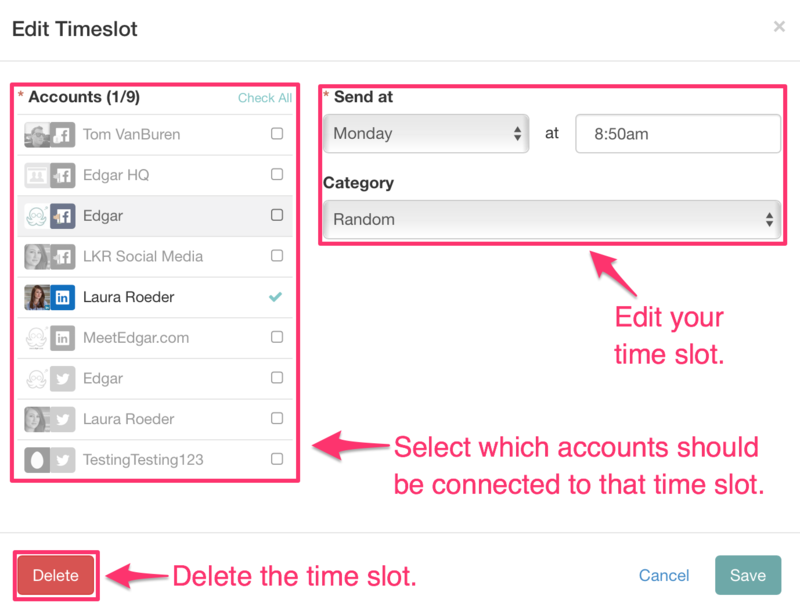 Learn more about how random works and how to exclude content from random here: Edgar's Random Time Slots. You can add a maximum of 1,000 time slots to your schedule.